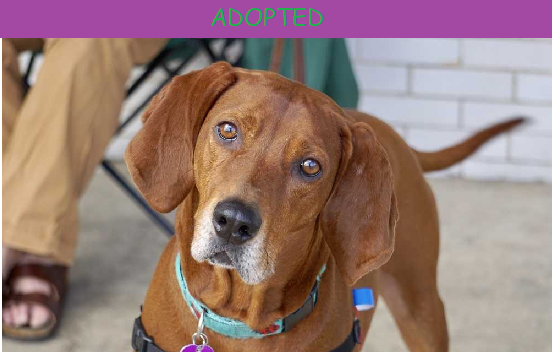 Valentine is a 58 lb Redbone Coonhound. He's about four years old and getting use to living indoors. He is now house trained and trustworthy enough to be free from the crate while his foster away. He still isn't crazy about going outside now when it's raining, but he will, especially if treats are involved. He loves toys. He would love to go for a run, or run around with children because whenever someone is running he exuberantly wants to join them! He's shy at first meeting, but he warms up rather quickly, especially to children. He's fine with other dogs, but we're not sure about cats yet. Valentine would love a forever family with children and/or active people. He is definitely a sweet, silly boy enjoying the life he missed as a puppy.